Valerie has always lived in a small village surrounded by a dark forest haunted by a werewolf every month at the full moon. For the last ten years the wolf has kept the peace with the town by accepting a sacrifice of a beloved livestock. Now Valerie is a woman and planning on eloping with her lover, Peter, to escape an undesired marriage to the smith’s son, Henry. Just as they are about to elope, though, Valerie’s sister is found dead. The victim of the wolf. Now the town brings in a priest of questionable character in an attempt to rid them of the curse once and for all. To me this film was truly all about atmosphere, being a feast for the eyes like the village is a feast for the wolf. Although the first few moments of the film are set in harvest time, the rest of it is during winter, complete with beautiful snowfall scenes. The village itself is simultaneously sinister and picturesque. What truly makes the atmosphere though is the costuming. Gorgeous elbow-length knitted gloves. Covetable dresses with the perfect waist-length. Sleeveless cloaks worn by all in demure shades that truly make Valerie’s red cloak pop when she receives it from her grandmother. The entire atmosphere screams fairy tale. 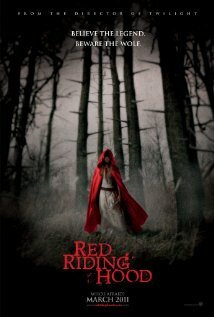 The story was of course re-written with red riding hood made into a young woman instead of a little girl. The character of the wolf became more complex than just the big bad wolf in the woods. However, the key creepy elements of the fairy tale remain. In all honesty, I was surprised at how good of an updated adaptation this was, and I’ve seen my fair share of fairy tale adaptations. The one draw-back was the awkward love triangle inserted into the story. There was one scene in particular that simply screamed “This director also directed Twilight!” Ugh. I’m getting incredibly sick of love triangles existing in any story that features young adults. Plus this scene elicited laughter from the audience, which I am pretty sure was not what the director was going for. Overall, however, this was a delightful adaptation of a beloved fairy tale. I recommend it to lovers of fairy tales and adaptations, as well as those who enjoy an exquisite atmosphere in film. Thank you! I was looking for recs for this film and am so happy you reviewed it! Oh yay! I hope you enjoy it if you go see it! Thanks! for the great review, I just might go and see it. I was ready to excuse, its misjudged use of music, its blatant attempts to copy the twilight movies, its OTT acting by Gary Oldman… but in the end it’s too silly for genre lovers, or those who were looking for something more refined like “in the company of the wolves” for example, and it’s too close to Twilight (almost like a copy of it); so much so that it actually annoyed what were meant to be the fans. Also, it must be said, a lot of those Twilight lovers came from the original books, here it all just relies on the similarities with another saga. Actually, I gave it 4 out of 5 stars, not 4.5 stars, but thanks for showing off your excellent reading comprehension skills to us. 4 out of 5 stars means “I really liked it,” or “It was enjoyable for the ticket price.” You see, not everyone who goes to movies is a snob, and thankfully Hollywood understands that.